Fortune Telling using Tarot Cards. Serena's Guide to Divination. The earliest unambiguous mention of a tarot trump (Major Arcana) occurs in 1442. The place was Northern Italy. Forget Egyptian, Lemurian, Atlantean or Gypsy origins. Sorry to burst your bubble, but the Tarot is simply an impressive game of cards originating from Renaissance Italy. Fortunately for us, its beauty and its scope make it a wonderful tool for divination. The Tarot deck consists of 78 cards which are broken down into 22 Major Arcana and 56 Minor Arcana. 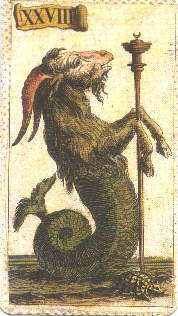 The Major Arcana are the trump cards, the Minor Arcana are the pip cards. The pip cards are similar to European playing cards (see the Playing Card Page) with the following difference: the Court Cards include a Page, Knight, Queen and King. The suits are Cups, Staves (Wands, Rods), Swords and Coins (Pentacles, Disks, Stones). The meanings for the cards follow different traditions in different countries and amongst the different decks available. Many versions of the Tarot exist. Most people are familiar with the Rider-Waite Tarot (pictured top left). This Tarot may be the most popular but it is fairly new on the scene, published in 1909. Beginners usually prefer this deck because of Pamela Colman-Smith's illustrations on the pip cards. The three most recognised styles of Tarot cards are the Rider-Waite Tarot, the Thoth Tarot and the Marseilles Tarot (pictured above left). Other versions do exist but most of the newer tarot decks are usually either based on Crowley's Thoth deck or Waite's deck. You can recognise a Rider Waite tarot or a Rider-waite based tarot by the position of the Justice and Strength cards. 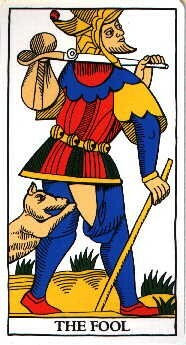 traditionally Justice is card 8 and Strength is card 11. However, in the Rider Waite Tarot (1909) these cards were reversed, ie. 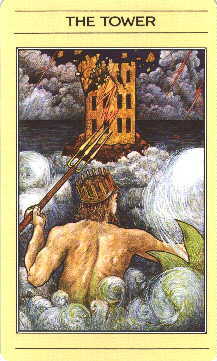 Strength is Card 8 and Justice is Card 11. This was done by Waite to make them better fit with the astrological correspondences worked out by the Hermetic Order of the Golden Dawn. Some of the more recently designed decks have taken traditional stories and based them on a Rider-Waite template. One success is the Mythic Tarot (pictured above, second from the left). Another interesting variant is the Wayang Tarot Indonesia which is based on the traditional Javanese Mahabarata philosophy and Ramayana mythology (pictured above, second from the right). 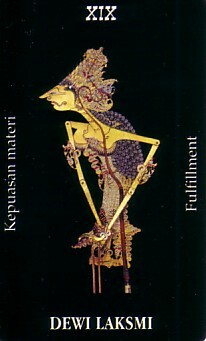 See more cards from Wayang Tarot. The Minchiate Tarot of Italy (pictured above right) is also very interesting in that it has 97 cards. This deck includes cards for the four elements, the twelve signs of the zodiac and extra virtues. The Ancient Minchiate of Etruria deck (1725) has the virtues Faith, Hope, Prudence and Charity joining the existing virtues of Strength, Temperance and Justice. The cards of the Papess, Empress, Emperor and Pope are replaced by only three cards: the Grand Duke, the Western Emperor and the Eastern Emperor. This deck can be a full handful to shuffle! Interpretations can vary between the various Tarot decks. Most people use the interpretations set out by Waite in 1909. However, there are alternate systems in use. For example, the Seven of Coins (Pentacles, Disks, Stones) can be interpreted as perseverance, long-term success, finetuning plans for success (Waite), disharmony, failure is possible (Haindl), rest after fatigue, reflexion, recovery (Ancient Minchiate of Etruria) or money, silver, purity, moon, innocence (Etteilla). Don't despair at the different Tarot interpretations available. As with playing cards, simply stick to the one system and it will serve you well. Readers take different viewpoints on interpreting the Tarot. It is very common at the moment to see a certain amount of disdain for the fortune telling aspect of Tarot. I prefer an approach that blends both the spiritual and predictive aspects of the Tarot. Then it is up to querent to absorb what he or she needs (or is ready for) from the reading. Get free online tarot readings by visitng my Tarot Readings page. Click here to read about spreads and the meanings for the tarot cards.